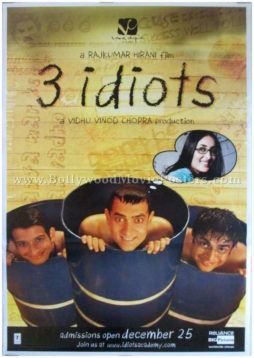 Bollywood poster of the cult Hindi film, 3 Idiots (2009) for sale. This is an actual surviving original Bollywood poster of the blockbuster 2009 comedy written and directed by Rajkumar Hirani that starred Aamir Khan, Kareena Kapoor, R. Madhavan, Sharman Joshi, Omi Vaidya, Mona Singh and Boman Irani in prominent roles. 3 Idiots smashed all box office records upon its release and was listed in the Guinness Book of World Records for achieving the highest box office collections for a Bollywood film. The film won 52 accolades, including five Filmfare Awards, ten Star Screen Awards, sixteen IIFA Awards, three National Film Awards and five GIMA Awards. Printed and circulated somewhere during the original first release of the film in 2009, this 3 Idiots movie poster was printed for publicity of the film but never ended up being used. The 3 Idiots, superstar Aamir Khan, R. Madhavan and Sharman Joshi are seen peering out of barrels in this hilarious movie poster. Aamir Khan is pictured thinking of his love interest Kareena Kapoor in a comic speech bubble in this 3 Idiots film poster. The phrase “Aal Izz Well” from the movie (which is also featured in a song) became a rage throughout the nation during the film's release and is quoted even today as a statement of reassurance. The highly acclaimed soundtrack of 3 Idiots was composed by Shantanu Moitra with lyrics penned by Swanand Kirkire. Songs like “Aal Izz Well” and “Give Me Some Sunshine” are fondly remembered and played till today. Following the tremendous success of 3 Idiots, a Chinese remake of the film produced by Stephen Chow is being planned. There are reportedly also plans for a Hollywood remake produced in the United States.